You are not logged in. 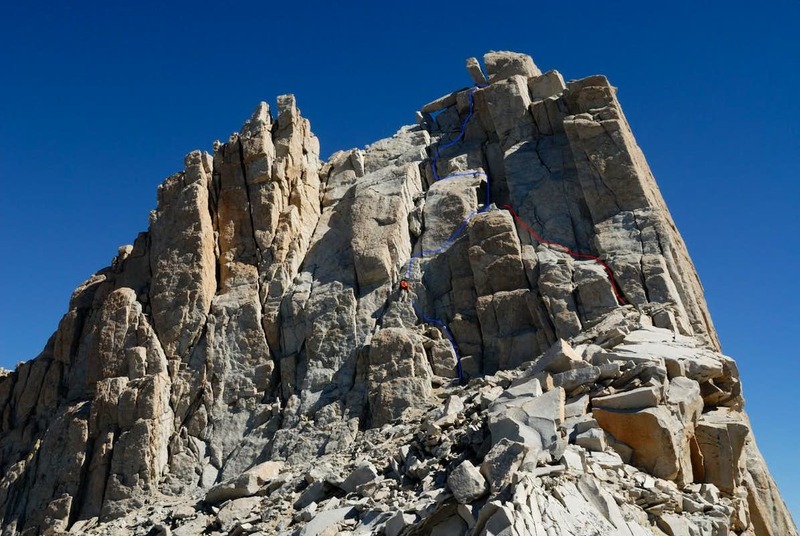 [Log In] Mt Whitney Zone » Forums » » General Discussion » I wonder which 14ers I can actually do? #33213 - 09/12/13 05:40 PM I wonder which 14ers I can actually do? I'm a day hiker with limited route finding skills. I have nearly 20 summits up Whitney, including once up the Mountaineers Route. There isn't too much route finding on the Mountaineers Route and my son and I were led by Richard P. I had no trouble on the ledges or the final 400, but again, I just followed along. I recently walked up Langley and we are headed to stroll up White Mountain soon. So I'm wondering - which 14ers does a guy with my skill set have a chance of sumitting? I'm guessing I could get Muir if I tagged along with someone else. It doesn't "look" to be worse than the final 400, but then again, what do I know? Assuming that miles, gain and hours needed are no problem and that only route finding and actual climbing are hurdles, which 14ers left on the list could be done? Definitely go for Split. Also Williamson and Tyndall. Then Middle Palisade -- its "final 1000" is like the final 400. Shasta requires crampons and ice axe, but it's not technical. Mt Sill and North Palisade would give you the toughest time. I did those when I was younger and bolder. Some tricky moves at the very end, but otherwise nothing super challenging (Potluck Pass is a good test of your abilities before the final climb). I always wanted to combine it with the High Route section from Palisade Lake to Le Conte, but so far have not been able to squeeze that detour into any hike. Muir is a tricky bit of rock-work. I'm of the opinion that it firmly crosses into the realm of Class 4. Tyndall is good, from Shepherds Pass your entire route is in view and apparent. Edit Reason: Then I misspelled some stuff. Thanks for the pics and info. I'm pretty confident I could get UP Muir, not so sure I could get safely down. Since that's pretty important, I need to either step up my skill set or go with someone else. Probably both. I take my son on pretty much everything, so I have to be extra careful. Unless you are really determined that it just has to be a forteener, Mt Agassiz (just under 14), from Bishop Pass is doable as a day-hike from the South Lake trailhead in less than 12 hours. Plenty of good camp sites along the approach trail, if you don't want to do it as a day hike. The West Slope route is class 2, with solid rock, no exposure, and easy route finding. It would be a good climb and safer for your kid than some of the other climbs. The view, from the summit of Agassiz, of the Palisade glacier and beyond is outstanding. I'm pretty confident I could get UP Muir, not so sure I could get safely down. Since that's pretty important, I need to either step up my skill set or go with someone else. Probably both. I take my son on pretty much everything, so I have to be extra careful. DUG, descending really isn't any more difficult than ascending. If you can go up something, it is definitely possible to down-climb it. Your only disadvantage going down is that it is more difficult to find the footholds going down, since you might not be able to see them as readily as when you climb up. And with that disadvantage, it is the worst when you are nearly vertical, so can't hang out a little bit to see your downward route. However, Muir and all but the most technical of the peaks here are NOT that steep. So you can pretty easily view your downward path with your eyes, and then proceed with your feet. On your way up, look down often, so you can recognize the route when you head down. It is not that difficult! Then why are cats always getting stuck UP in a tree? What you says sound good, but I have no experience. When we did the Mountaineers Route with Richard P we came down the main trail so he could show us all the short cuts. Yup: that's why so many climbers simply downclimb their 5.15 overhanging routes. Yup: I REALIZE that's an extreme example, but what is simple scrambling for one person is another person's death trap. And, having just lost someone on "Class 3 terrain", you can't tell me that going down is just a simple reversal of going up. Also, might I suggest we watch the definition of "technical", please? Saying that something requires snow equipment, but in the same sentence saying the climb isn't technical is a gross sandbagging of what might be required to safely climb a mountain. To me, at least, anything requiring specialized equipment beyond than your lower limbs and trekking poles makes a climb technical. Other interpretations lead to people thinking they can take something like microspikes and use them on terrain other than a flat trail. You know I would LOVE a little Moose trek! No thoughts of being a peak bagger or trophy hunter. I'll do as many as I safely can in my lifetime and be good with it. Bob West has already suggested another fine peak that I haven't ever even heard of that deserves a look. I was just curious, knowing my somewhat limited skill set and my over cautious nature, which of the 14ers I could do. I'm willing to try new things and improve my skills, but I have to many interests and hobbies in life to focus on becoming a super skilled mountaineer. I would like to be able to find my way around the back country without a trail more often though. DUG, descending really isn't any more difficult than ascending. If you can go up something, it is definitely possible to down-climb it. Ah, yes the "if you can go up something, you can go down it" oversimplification. How many times have you witnessed someone forward down-climbing terrain that should have been a face-in down-step? Point: many people cannot handle the face-in ladder position of a class 3 and above down-climb without an adverse reaction (if they have not practiced it a bit). Muir: I was the gear babysitter for a group who did Muir, and again, I would suggest that due to a couple of semi-technical maneuvers (laybacks)(the turn-twist maneuver) that I witnessed as a newbee, (if not a technical climber), I would only advise doing the otherwise simple route with an experienced individual only, during the first attempt. Thank you Bee and Laura, for injected some much needed reality into the topic of "down-climbing." Experienced rock climbers (and SAR personnel) can tell you, with experience based authority, that the descent is often more dangerous than the ascent. What seemed easy going up can become a major problem while descending the same route. During a good snow Winter (sigh) years ago, a couple of very experienced climbers and skiers decided to ski over the crest at Echo Col. One of the guys climbed up a nearby cliff to see if the West side looked do-able on skis. About 90 feet up he tried to down-climb his ascent route and discovered that he couldn't. His partner skied out and called for help. Inyo SAR arrived on the scene near Echo Col, via a very dicey helo flight at 2 AM, and climbed to the stranded climber/skier. SAR personnel lowered the guy down to safety. Post script: the very same rescued climber/skier was killed a couple of years later, while descending the Petit Dru in the French Alps. It's all well and good to say that climbing down is as easy as climbing up if it is Class 2 or easy Class 3 - assuming the absence of route finding problems. But above those levels problems can occur. Most experienced climbers will seek a safer descent route or rappel if they have to. It really angers me when some contributors to this forum offer climbing advice to people they have never met, or climbed with, without first-hand knowledge of the person's experience, climbing ability and physical fitness. Some self-proclaimed "experts" and "hard-men" ought to just STFU. Me. Clyde Minaret. Case in Point. "This is as big a puzzle on the way down as it was on the way up!" -my climbing partner that day. Sheesh people! I was just trying to encourage DUG to try Mt Muir, not some 5.15 overhang, or Echo Col or Clyde Minaret. I wouldn't get close to any of the last three, and I wouldn't encourage DUG to try. I was just talking about Mt Muir. Please, ya kinda blasted me with the anger and harsh words and extreme examples. I have to admit, though, that I quite a few times I have underestimated the difficulty of some terrain. What most of us would cruise through have turned out to be major obstacles for someone I encouraged to come along. So I'll offer my apology. But I still think DUG, based on his climbing the MR, and his routfinding to the Gamblers site, could get up and back down Muir. Speaking as a non-blaster, in all fairness, your post was very ambiguous in terms that it sounded like you were making a general statement about Ups and Downs. I appreciate the advice, encouragement and suggestions. Seriously I do. I am extremely cautious in the back country. Maybe more than I should, but I come home safely after every trip so I can live with missing out on an epic. I was curious about Muir and some other peaks mainly because I know my limitations. Yes I went up the MR and had no problems. But, on the other hand I was just following my son who was lead by Richard P. I didn't really have any problems but I just put my hands and feet where I was told. We did not down climb. So I have never really down climbed a route. I did successfully route find my way to the Gamblers Special Wreck. That is a route that has stonewalled a few hikers before me. The thing here is I researched it for three years and failed once. Also after you make the correct turn its simply UP. If you can handle the elevation gain you can not get lost. If you go up you will get to the tarn. Pick the easiest path and go. A monkey could do it. And if you fall, you'll need a band aide, not a body bag. DUG, I owe you one from our discussions a couple of years back. I'd love to share some trail time with you. I know this peak well. I haven't decided what to do around next weekend, but it could easily include Mt. Muir, which would be my 37th ascent of it. I climb it class 3, but I have seen and removed many rappel slings from the route, so some treat it class 4. I wouldn't argue with them; climbing difficulty is subjective. Based on what you've written, I think you would do fine on Mt. Muir if you went with someone who's climbed it before. Also Split, Williamson, and Tyndall if by the easiest routes. The others? I'll defer my recommendations until we've shared Mt. Muir. As Bob West suggested, too many people offer climbing advice to those whom they've never met. Bob, Thank you so much for the offer. I'm headed up to the Portal Wednesday and plan on walking along the the main trail on Thursday. I'm retired now so M-F is pretty easy to get away, but weekends are tough due to family/scout commitments. I would be honored to hike with you and I hope we can get our schedules to mesh. Generated in 0.176 seconds in which 0.134 seconds were spent on a total of 14 queries. Zlib compression disabled.